Today’s post explores an inspirational quote that is often falsely attributed to Samuel Taylor Coleridge. It isn’t as widespread as most of the other misquotes I’ve written about; however, its evolution has some interesting twists and turns worth mentioning. Here is the title page of the play The Piccolomini by Friedrich Schiller translated by Samuel Taylor Coleridge. Note Coleridge uses the anglicized form of Schiller’s first name. This misattributed quote only appears on a handful of websites, but the statistics tell the same old story. As usual, the statistics reveal it is the websites dedicated solely to quotes that make up the largest percentage of misattributions (36%). Websites with quotes as a major feature constitute another large piece of the pie (21%). This means quote-oriented sites make up 57% of the source of this misquote. Once again, we see that quote websites are the worst resource for quality quotes. Avoid them at all costs. Only use verified sources that include the author/orator’s name accompanied by the work in which the quote is found followed by applicable information such as chapter, act, scene, stanza, line, etc. The originator of the quote is German poet and playwright, Friedrich Schiller, best known for his play William Tell. The source of the quote is The Piccolomini, a drama completed by Schiller in 1799. The confusion begins when the work gets translated from German into English by Samuel Taylor Coleridge in 1800. It is this translated version that is the root of the misattribution. The title page in figure 2 illustrates how easy it is to misinterpret who the author is. With his poems The Rime of the Ancient Mariner and Kubla Khan, Coleridge is a celebrated poet in his own right. His famous name appearing on any literary work would lead most people to believe he authored it. On the title page, the words “Translated from the German of” are in a very small font size so they are easily overlooked. This is most likely the major reason Coleridge gets credit for Schiller’s work. Another contributing factor to the misattribution is that Coleridge anthologies often include works that were translated by him alongside works that were written by him. Unfortunately, the table of contents does not always indicate which works were originated by another author. This creates a situation where the reader will never know a work was authored by another writer until s/he reads the one page in the book where it is stated (typically the page on which the work begins). This scenario is not uncommon. My 10/21/14 post titled “Who wrote it? Wordsworth or Michelangelo?” is another example of a translator getting credit for work he did not author. Note the exclamation point in the correct quote. In the world of quoting, exclamation points and question marks should not be removed because they convey meaning. The misattributed version has the exclamation point deleted which is incorrect. Note also the correct quote begins with the contraction “There’s” while the incorrect quote begins with “There is.” The original form should always be retained, especially if the author is a prominent literary figure as both Schiller and Coleridge are. It is downright sacrilegious to alter the words of the greats. After all, their exemplary talent in the craft of writing is one of the reasons they are being quoted in the first place. When quoting from a poem, the virgule (forward slash) indicates line divisions. Figure 1 shows the last word of the quote begins a new line; thus a virgule is inserted accordingly into the citation. Note also figure 1 has line numbers showing the quote begins on line 15 and ends on line 16. The quote can be found in Act I, Scene VI of The Piccolomini. AND the quote can be found in Act II, Scene I of The Piccolomini. Both are correct. How is this possible? Well it turns out there are two versions of the play. 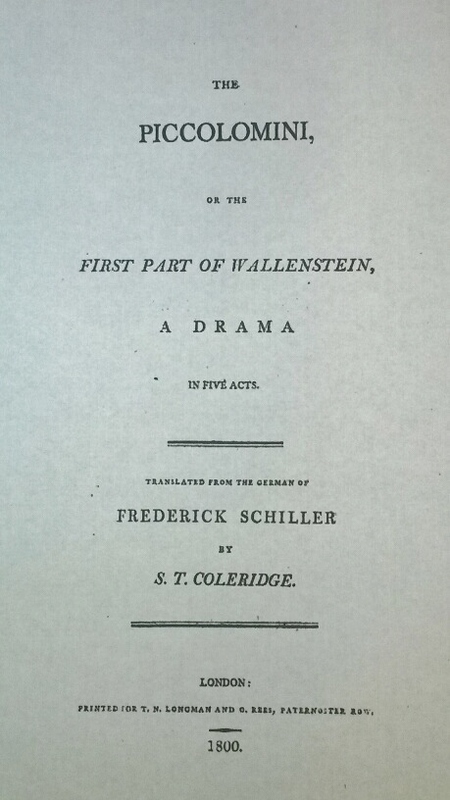 Coleridge was sent the original version which had a total of 12 scenes in Act I. Schiller then restructured the play for the print edition to have a total of five scenes in Act I. This caused Scene VI to be moved forward into Act II becoming the first scene therein. The following is a side-by-side comparison of the two versions to better illustrate how the two variations came about. If you do a search for this quote on the internet, you will encounter both versions. In summary, if the quote is from the original version, it will be found in Act I, Scene VI. If it is from the newer, restructured version, it will be found in Act II, Scene I. The third translation was heavily criticized in reviews and magazines of the day, but I’m still including it to illustrate how wide translations can vary. Notice all of them include the word “world” or “earth” except for the one by Coleridge. How do we know which is the most accurate? Maybe Coleridge is off the mark. My point is that translated quotes are not reliable. My 06/17/14 post titled “No, that’s not how Benjamin Franklin wrote it” includes another example of this involving a Latin quote with five very different English translations. Once again, we have a misattributed quote available for purchase. I came across a website selling t-shirts printed with the misquote for $24.95. What a bargain! Incredibly interesting blog. I found the most interesting twist to be the multiple versions of the play, The Piccolomini, being responsible for two correct variations of the quote. Thanks for casting a light on this widespread problem. Yes, the misattribution of Coleridge to ‘The Piccolomini’ does indeed appear in ‘Bulfinch’s Mythology’ but only in the later editions. The book was published in 1867, but the misattribution doesn’t appear until the 1930s within the preface (at least that was the earliest I could find). Either way, there are earlier publications with the misattribution. For example, ‘The Loyal Ancient Shepherds’’ quarterly magazine published the misattribution in July 1849 (No. 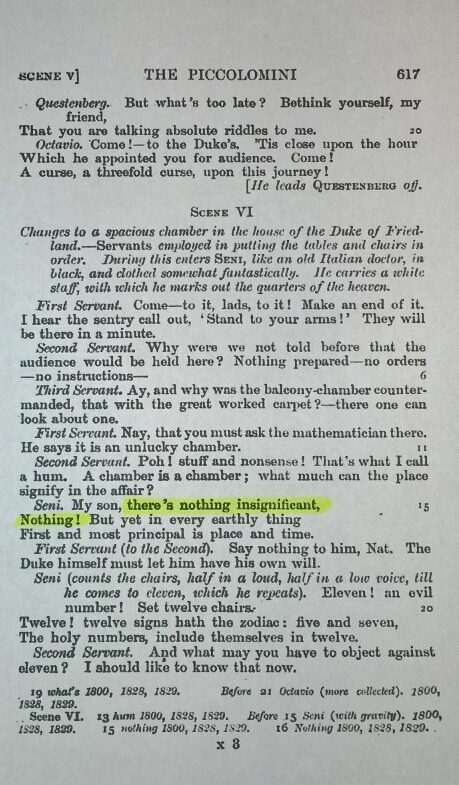 17, volume III) on page 13. Note, instead of ‘The Piccolomini,’ they used ‘Wallenstein’ which is the name of the trilogy in which ‘The Piccolomini’ is the second play. There was also the quote book ‘Many Thoughts of Many Minds’ by Henry Southgate published in 1861 which features the actual quote misattributed to Coleridge. This book was actually first published in 1857 under the title ‘Many Thoughts of Many Things.’ Because these publications (and possibly others) were prior to ‘Bulfinch’s Mythology,’ it can’t be considered THE source or birth of the misattribution. However, I’m sure it contributed to it. Thanks for your comment and happy quoting!